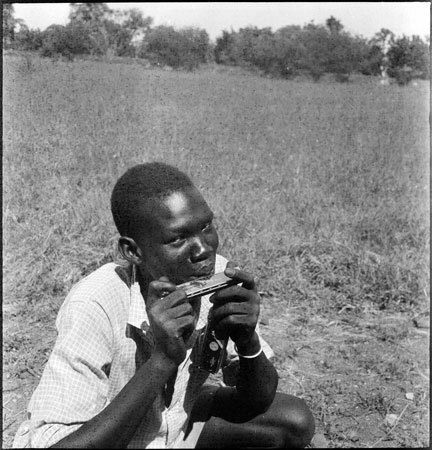 A Dinka youth wearing a checked shirt crouching on the ground, playing a Hohner mouth organ. Morton, Chris. "Dinka youth playing mouth organ" Southern Sudan Project (in development). 03 Jan. 2006. Pitt Rivers Museum. <http://southernsudan.prm.ox.ac.uk/details/2005.51.272/>.